A slow-burning masterwork of the early 1990s, this third feature by Charles Burnett is a singular piece of American mythmaking. 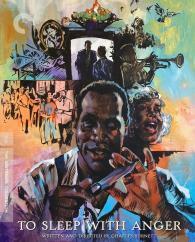 In a towering performance, Danny Glover plays the enigmatic southern drifter Harry, a devilish charmer who turns up out of the blue on the South Central Los Angeles doorstep of his old friends. In short order, Harry’s presence turns a seemingly peaceful household upside down, exposing smoldering tensions between parents and children, tradition and change, virtue and temptation. Interweaving evocative strains of gospel and blues with rich, poetic-realist images, To Sleep with Anger is a sublimely stirring film from an autonomous artistic sensibility, a portrait of family resilience steeped in the traditions of black mysticism and folklore.